Reward your feet with Gemma, a cuddle-worthy ultra soft closed toe slipper with a sturdy rubber sole, luxuriously designed from heel to toe. 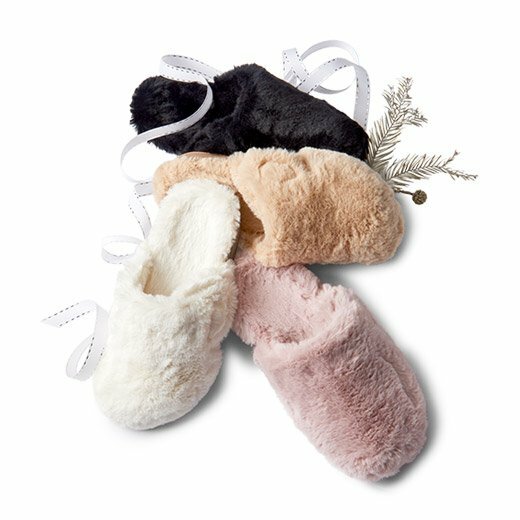 Soft faux fur footbed and upper surrounds your foot in softness. Footbed is covered with 100% polyester faux fur. With our new Gemma Plush Slipper, your feet will feel like they’re hugged by your favorite cozy blanket, and supported by our innovative technology. I am on my second pair of Vionic house slippers. I will not wear any other slippers ever again. They are so comfortable and are very durable. After I had these slippers for 2 days I noticed globs of the 'fur' around my house. Then the very fine elements of the fur started to shed. I returned them. I think I've met my match! I received these slippers as a Christmas gift and it was by far my best gift! I struggle with plantar fasciitis and have very flat feet. Standing barefooted for any period of time is extremely painful. I always have to wear my shoes when I'm in doors or suffer from sharp heel pains. I wanted to try these slippers out for a while and when I received these as I gift I have never been happier. I wear these everyday and slip them on as soon as I get home. Even my boyfriend tries to wear them! I would admit, the "plush" does shed quite a bit but I doesn't bother me. I just vacuum or pick it up. I'm so happy I no longer have to suffer from sharp pains while at home! I take these with me even when I travel. I love the feel and it has definitely helped my planter fasciitis. However, the faux fur in three weeks is worn out and down to bare sole. It would be great if the inner sole was of a different fabric that would wear better. Sadly disappointed. Great comfort over all. Great arch support for my flat feet. Runs true to size. Not very cushioned on the bottom, however they are still very comfortable. The only complaint I have is that to the very durable sole of the slipper, they tend to feel heavy and bulky at first. I do recommend these. Would purchase again without question. This is my 5th pair of Vionic's and the only ones I don't love. They are slippery and hard to keep my feet in them when walking. Socks help but who wants to wear socks with a plush shoe? I want to feel the plush. Don't waste your money on these! Choose something else! It was advised to spot clean them. Plush house shoes will not be clean like that. I looked online and a hack suggestion was to put them in the dishwasher with minimal or no soap! Evidently the shoe will be damaged otherwise?! For the price and quality there has to be a better way! Suggestions?